The battle continues with politicians acting out and I would say not modeling mature Leadership behavior for their constituents. 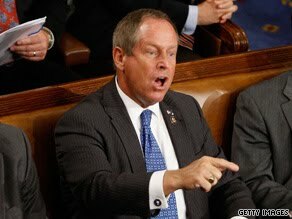 Joe Wilson, Representative from South Carolina, shouts out and calls the President a liar while Louie Gohmert, Rep from Texas sits in the audience with a protest sign hanging around his neck. People are clearly very passionate about the issue of healthcare reform but what we are seeing is not a constructive effort to resolve this complex contentious issue but politicians throwing tantrums and exhibiting entitled behavior. Would you tolerate this in your company? Is this helping to move us closer to a resolution on the issue? I doubt it.